Shown here with his brethren of the “Git’ Box,” jazz man Jacques Lesure trading road stories , flats and sharps, and whats on tap for the next Jacques Lesure CD. 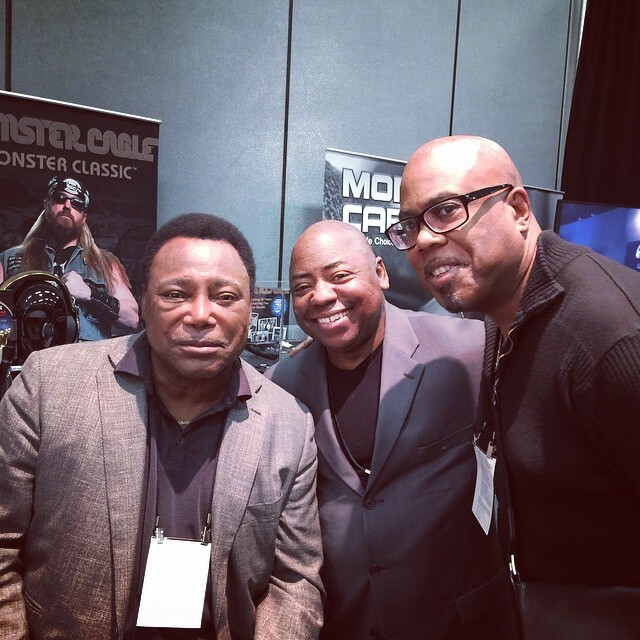 Left to Right, Grammy winner George Benson, Paul Jackson Jr and Jacques. Noted Jazz Drummer, Willie Jones III , president at WJ3 Records announced the release date as sometime in the spring of 2015 , possibly April stated, Ed Lovell, Lesure’s longtime friend and manager. Jacques Lesure’s sophomore CD on WJ3 Records will feature Jones III hitting drums, but also composition contributions from journeymen jazz artists, Donald Brown (grammy nominated pianist) and Eric Wyatt. Jacques Lesure, a Los Angles-based guitarist is originally from Detroit, Michigan; home of the famous Motown sound. Jacques attributes his sense of style and signature sound to his development in Detroit. “Growing up in Motown, you can’t help but be influenced by some of the greats like Tommy Flanagan, Kenny Burrell, Betty Carter; great gospel artists such as The Clark Sisters, The Winans and singer Fred Hammond, they’re all from Detroit” said Jacques Lesure.